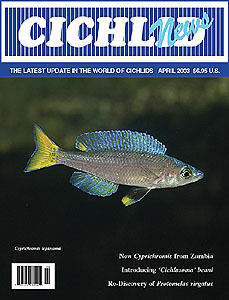 New Cyprichromis from Zambia by Ad Konings. These open-water forms from Lake Tanganyika display a dazzling array of variation both within and between species. Experiences with ‘Cichlasoma’ beani (Gill 1862) from Northwestern Mexico by Dan Woodland. This little-known species has the northernmost range of any cichlid along the Pacific coast. Protomelas virgatus — Part of the Puzzle Solved by Ad Konings. Just back from Lake Malawi with clarification within a problematic group. Fish as a Living Environment for Microorganisms: Bloat in Tropheusby David Tarragó. This interesting approach to a common malady incorporates the interaction among ecology, stress and disease vectors. What Should Shell-Dwelling Cichlids Be Called? by Martin Geerts. And you thought keeping up with cichlid names was difficult!